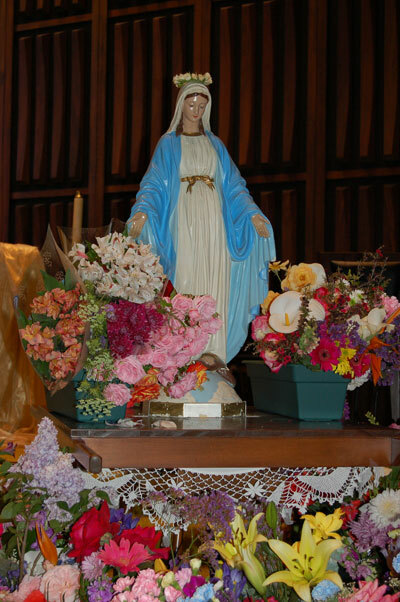 Assumption of the Blessed Virgin Mary Parish was established in 1950 with Reverend Timothy Crean as the first pastor. Created from portions of five other parishes, property for a parish plant was located and permits for a temporarychurch and four classrooms were granted in 1951. The first unit of Assumption of the Blessed Virgin Mary School was completed in 1952. September brought the opening of the school with grades 1-4 and an enrollment of 168 students. The order of the Sisters of the Holy Child Jesus provided teachers for the school. Four more classrooms were added by September 1953, bringing enrollment to 280. By 1955 there were grades 1-8 with a total of twelve classrooms and 441 students. The cafetorium was built and was used for extra classrooms as needed. A permanent church, convent, and rectory were added in the 1960s. In the early 60’s the school reached its highest enrollment with 600 students. A full-day kindergarten was added in 1990. Assumption School was blessed with the presence of the Sisters of the Holy Child Jesus for twenty-four years. In 1976 fewer vocations made it necessary for them to withdraw from Assumption. Lay principals were drawn from the existing faculty who were ready to carry on the mission and legacy of the Sisters. Reverend Monsignor August Moretti, came to Assumption Parish in 1984. He continued to support the school, valuing it as an integral part of the parish community. After twenty years as pastor and over fifty years of priesthood, Mgsr. Moretti, pastor emeritus died in 2009. On February 2, 1999. Monsignor Crean, pastor emeritus died in Ireland. In his living will, he remembered Assumption School with a bequest of $20,000 for technology and the library. The library was moved to its current location and was enclosed and air-conditioned. The computer lab was also created and is constantly being updated. We hope to keep alive Mgsr. Crean’s dedication to the education of future generations of Assumption students. Father Gerard O’Brien, from the same town in Ireland as our first pastor, Mgsr. Crean, came to us as pastoral administrator in July 2004 and two years later he was appointed pastor in 2006. He continues to value the parish school as a vital part of the parish. Father Michael Ume joined us in August 2018. We keep ourselves under the protection of Our Lady of the Assumption, so beautifully portrayed in the mosaic by Isabel Pizcek on our school wall.